Mobile devices like the Apple Watch have a drawback: their small screen size makes them difficult to use. Computer scientists at Saarland University have now developed an alternative, which they call "DeformWear." A tiny switch, no larger than the head of a pin, is built into a ring, for example, and worn on the body. It can be moved in all directions, pressed, pinched, and pushed toward the right, left, up, and down. "With mobile devices such as the smartwatch, the interactive screens are so small that only a few control commands can be triggered by individual touches," explains Jürgen Steimle, professor of human-computer interaction at Saarland University. 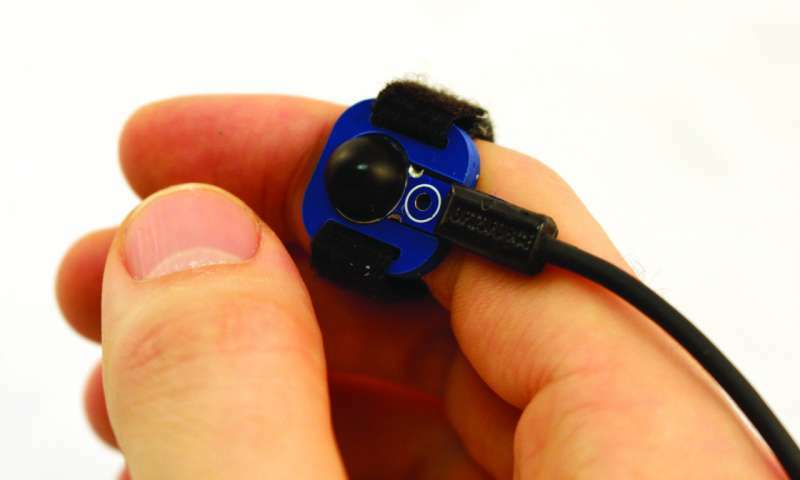 He is searching for new ways to operate small, body-worn mobile devices as discreetly and quickly as possible. In an earlier research project, Steimle, together with his colleague Martin Weigel, showed that human skin can also work as an input device. During this study, the idea for the current project occurred to him. "We found out that our study participants did not just use the known smartphone gestures on their skin, but also pushed it to the side or even pinched it with two fingers, in order to control mobile devices," reports Martin Weigel. Further investigations led to a sensor that was actually intended to make robot hands more sensitive. "Although the sensor was developed for robotics, we found its small form factor promising for body-worn mobile devices," explains Weigel. The small form factor, in this case, is a sensor that has a diameter of only 10 millimeters, about the size of a pea, that can be deformed like a balloon. From the inside, an infrared LED illuminates the deformable membrane. The light is reflected and measured by four photodiodes. These measurements can then be used to calculate how the sensor is being deformed. To test their idea, the researchers integrated this sensor into a ring, a bracelet and a charm about the size of a 50-cent piece. The challenge was to develop gestures and use them to control mobile devices. The researchers did this for a smartwatch and for virtual reality glasses. They also defined motion sequences to control a television and to play music without having to look at the device. The Saarbrücken computer scientists then had 24 people test them a total of 18,141 times. "Despite the tiny surface, the interactions are precise and expressive, since they make use of the fine motor control of the fingertips and of the three primitives pressing, pushing and pinching," says Weigel. Professor Jürgen Steimle is convinced that "when only a tiny sensor needs to be deformed for input, mobile devices can be worn at places on the body that enable quick and discreet input. This will help the industry bring even smaller control devices to the market."